Heroes can now discover secret rooms and investigate suspicious rumors, while the Overlord equips himself with deadly never-before-seen tricks as he fields a powerful new lieutenant. Dark secrets await within Valyndra’s lair. Do you have the courage to face the dreaded Wyrm Queen? 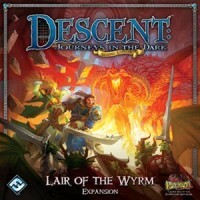 Add a Review for "Descent: Journeys in the Dark (2ed) – Lair of the Wyrm"